Today one of Nicholas' friends opened a lemonade stand to raise money for the Heifer Mission project in Mozambique. Since it was a squillion degrees outside, we thought that sounded like a great way to cool off. We enjoyed the sweet lemonade and even sweeter time with our friends. There was lots of fun to be had with sidewalk chalk, face/hand painting, and bug hunting. At some time during a bug hunting excursion, my sweet little boy discovered a real "treasure" (remember - treasure is in the eye of the beholder). 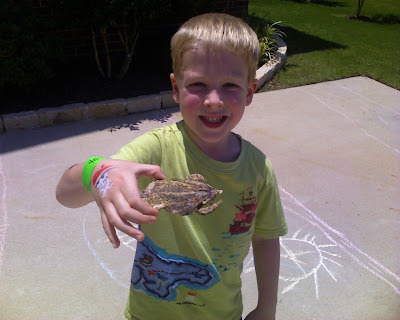 He came running up to me to show me his find...a toad that had been flattened by a car and then dried to a crisp in the sun. Eeewwww! The boys found a couple of these and, being the boys that they are, they all thought they were pretty cool to play with. ...or in this case, a squished dried out toad!